Tattoo stencils are both loved and hated within the industry and in tattoo culture. Some see them as a disgrace to the art and the integrity of tattooing. Most people in the industry advocate tattoos that represent a person’s emotions, feelings, past experiences, and inner essence. Others disagree with this notion and promote the use of tattoo stencils for accuracy, symmetry, and ease of use. This is a short guide to explain the history of tattoo stencils, what the pros and cons are, and how they are used. Tattoo stencils originally began with the use of tattoo flash. Tattoo flash is a tattoo design or concept that is drawn on paper or cardboard. These designs usually hang on the walls of tattoo parlors, but they were originally designed by tattoo artists for rapid tattooing. Most of the flash that is common today was drawn by what is now known as “flash artists.” These are artists who hand draw, copy, and distribute their designs over the internet to millions of parlors around the world. Most tattoo flash comes with an outline sheet that is the foundation of the tattoo stencil. Flash artists have been designing stencils since the late 1930’s and have employed different methods to create the stencils and distribute them in a way that is user-friendly to the artists. Today there are multiple websites that show a variety of tattoo stencils and flash. Over time, different technology has allowed the use of tattoo stencils to be much easier and more efficient. Original stencils were made out of plastic and then rubbed on with a carbon powder. The stencil would then be applied to the skin with an ointment to ensure that it would stay in place. This method of using tattoo stencils took up a lot of time and effort and was not very efficient. Tattoo stencils would slide out of place and the designs were limited to what could be carved into plastic. In the mid 1950’s when the modern copy machine was invented, tattoo and flash artists recognized how much easier making tattoo stencils could be by changing up their tactics. Today most tattoo stencils come with an outline, also known as a line drawing, which saves artists a lot of time. The tattoo stencil is applied directly to the skin leaving behind a permanent outline that the artist then works over. Some of the obvious pros of tattoo stencils are the ease of use to the tattoo artist. The artist simply places the stencil on their skin and starts to ink away. It is also beneficial for the consumer because it can save a lot of time thinking about what type of design they want. Tattoo stencils also save a lot of time because most of the tattoo session will consist of filling in the blanks and coloring within the lines. Though all of this sounds very simple, there are many cons to tattoo stencils as well. Most stencils are just a basic idea of what a design should look like. 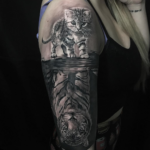 Professional artists will encourage a customer to help develop and reflect their own concept and theme, which can then be designed into a tattoo with the help of an artist. Many tattooists will also tell their customers to use flash and tattoo stencils as a way to help develop their ideas, not to be used as a literal tattoo because it does not represent them as an individual. Tattoo stencils offer an alternative way to get creative with your own tattoo concept, and help contribute to the development of the design. Since tattooing is an art form of self-expression to the world, many people who live within tattoo culture do not regard tattoo stencils as real tattoo art. 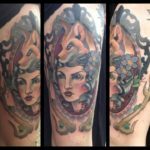 There is no doubt that shading, accents, hue, color mixing, and other factors play an important role in the way a tattoo will look, but part of the tattoo is designing it yourself so that it reflects the individual within. Then again, there are also many enthusiasts who do not live their life within the framework of tattoo culture and are simply happy with a design taken from a tattoo stencil catalogue. 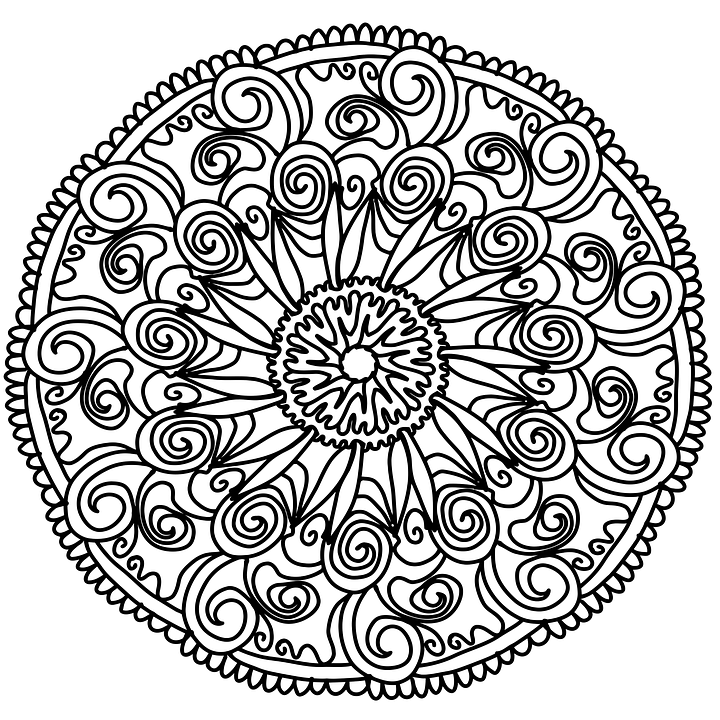 If you decide to simply use a tattoo stencil, then choose an artist who can shade and color in a style that you like. This might take a bit of time to find the right artist but it’s better to invest some time and get the perfect art rather than bearing a tattoo that looks bad.